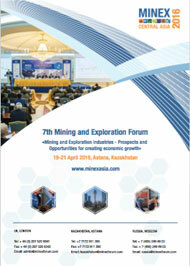 The 4th Mining and Exploration Regional conference – MINEX Far East 2014 will be held in Khabarovsk on 22-23 April 2014 with the official support of the Ministry for Development of Russian Far East. The MINEX Far East conference is a regional event of MINEX Russia forum. It promotes the development of advanced mining methods and stimulates geological exploration in the Russian Far East. In 2012, the conference was held with the official support of the Ministry for Development of Russian Far East and was attended by over 150 delegates Russian and foreign exploration and mining companies, government authorities, banks and investment companies, manufacturers and mining exploration processing equipment, scientific research organisations, engineering companies and consultants. The 4th regional Mining Conference MINEX Far East 2014 was held on 22-23 April in Khabarovsk, Russia. The exhibition GornopromNedra Far East 2014 was opened on the same day. Companies involved in technical support to the mining industry presented their products and services. MINEX Far East conference is one of the most prestigious events attracting subsoil users, mining companies and manufacturers of mining machinery and other equipment as well as investors in this sector. The conference in Khabarovsk brought together over 80 Russian and international companies and Government officials interested in development of the mining industry in the region. UGC Group (Russia), companies from POLYMETAL Int. (UK) structure, Auriant Mining (Sweden), IHC Merwede (Netherlands), Ferronordic Machines (Sweden), Krastsvetmet (Russia), IRGIREDMET and some other daughter companies from PETROPAVLOVSK PLC (UK), Amur Minerals (UK), FLS Knelson Rus (Russia-USA, Irkutsk branch), Siemens Finance (Russia-Germany, Vladivostok branch), Gold Mining Company “Pavlik” (Russia, Moscow-Magadan), Far Eastern Department of ROSNEDRA (Dal’nedra), representatives from various Far Eastern regional governments and many others took place there. On the first day of the conference participants heard presentations covering the most relevant topics. Among the speakers were Valery Vologin (Dalnedra) – “The results of geological work in 2013 on the territory of the Russian Federation, plans for 2014”, Mikhail Leskov (Union of Gold Producers) – “Results for the gold mining in the Far East and the Baikal region in 2013 and its prospects for the future”, Randolph Lewis (President of Russian Operations, Amur Minerals) «Issues facing development of new base metals mining projects in the Far East on example of copper-nickel deposits with associated PGM at Kun-Manie ore field” and many other important and interesting presentations. At the end of the first day the speakers and the representatives of Ministry of Far East Development participated in the round table discussions. Also on the first day of the conference three simultaneous technical sessions were held and the audience broke into three groups according to their areas of interest. Participants of the technical sessions also presented reports and participated in the discussions. Among particularly interesting presentations were: “The main results of complex geological research and exploration within Albazino ore field in the Khabarovsk Territory,” which was delivered by Vladimir Kirillov (JSC “Polymetal”), «How modern mining equipment can improve the profitability of the mining operations» made by Willem Clements (IHC Merwede), “The recent experience of modernization and construction of large bucketladder dredges in Russia” introduced by Maxim Luchko ( Irgiredmet), “Increasing the recovery of heap leaching at refractory ores ” presented by Alexander Zabolotsky (Auriant Mining) and others. The day ended with the round table discussion. The second day of the conference was equally busy filled with three technical sessions and master-classes where the participants made presentations and took part in discussions. Technical sessions were addressing the following topics. The first session was – “Issues of re-processing of technogenic materials and waste management in mining and metallurgical industries in the Far East of Russia.” Among the speakers were also Vladimir Litvintsev, Deputy Director of Scientific Affairs of Mining Institute at Far East Branch of Russian Academy of Science who spoke about “Technogenic alluvial deposits and problems of their development,” as well as Vladimir Mit’kin, Minister of Natural Resources and Ecology of the Magadan region with the presentation on “Development of technogenic deposits” . The topic of the second session was “Questions of optimization of the life cycle of mining projects in the Far East of Russia.” The participants heard presentations from Leonid Lomako (“Credo-Dialogue”) “MINEFRAME complex as a modern tool for mining operations”, Dmitri Budaev, project manager of LLC “Thermo Techno” “Automation control of analytical systems for non-ferrous metals mining and metallurgy”, and other reports and they also took part in discussions. The third session of a day “Economic evaluation of projects and preparing them for funding” voiced useful information and professional advice given by Mikhail Leskov (Union of Gold Producers, Moscow) and Alexander Bily (LLC Nedra, Magadan). The three plenary sessions: “Occupational health, industrial safety and ecology in geological and mining projects in the Russian Far East”, “Sustainable development and financing of mining and geological projects in the Far East of Russia” and “Discussion of the results of the conference and formation of a memorandum on its results ” were also held on the second day. The main issues discussed at the conference were summed up at the roundtable that was held at the end of the Forum. Next day after the conference some participants visited Polymetal’s Amursk POX plant – the only full scale operating POX facility in the Russian Gold mining Industry. Visitors had a unique opportunity see the working autoclave and to learn first-hand about this complex and most advanced gold producing technology in Russia. Delegates also met the Plant management and were able to ask questions and receive more detailed explanation about technical aspects of this front-end operation. Welcome addresses of administration, authorities and foreign guests of the Conference. Analytic reports concerning current market situation. Major companies’ presentations. Analytic reports concerning situation of industry’ sectors and their investment climate. Sessions 3 and 4: Technical session A. Hard rock mineral deposits prospecting, exploration and evaluation issues in the Russian Far East. Sessions 5 and 6: Technical session B.
Alluvial mining and processing issues in the Russian Far East. Sessions 7 and 8: Technical session С.
Heap leaching in cold climate. Sessions 9 and 10: Technical session D.
Sessions 5 and 6: Technical session E.
Sessions 7 and 8: Technical session G.
Operational health, safety, social and environmental impact issues of mining projects in the Russian Far East. Operation improvement and economic efficiency for mining projects in the Russian Far East in spite of fund raising. Roundtable summary of the Conference: 17.30-18.30. ATTENTION to MINEX FE 2014 participants. You have unique possibility after the Conference to visit Amursk Hydrometallurgical Plant of POLYMETAL PLC, the only pressure oxidation plant operating in Russian gold mining industry. The visit will take place on 24th of April, will start at 07.00am with return at 11.00pm same day.The visit price for MINEX FE 2014 delegates is US$200, travel costs and meal include. An amount of places for the visit is VERY LIMITED.